Today (April, 15) is early registration deadline for the Peach Blossom Stroll – please email Donna Livingston your intentions and your t-shirt size – then get her your money. 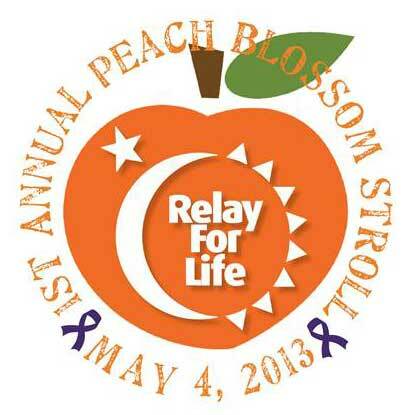 Mark your calendars for the 1st Annual Johnston Peach Blossom Stroll to be held on Saturday, May 4, 2013 at 9:00 AM. All proceeds will go to Relay for Life – Edgefield County. Registration and Start/Finish Line will be at the Johnston Municipal Parking Lot. The route will be 1.6 miles out Calhoun Street with a turnaround point at the old Beason Cleaners with strollers returning to the finish line back at the municipal parking lot. Lace Up in Your Purple and Come Out to Join Us in This RELAY Supported Event. Parade – starting @ 10:30 AM, Arts, Crafts, Food Vendors, Live Entertainment all day, Bounce Houses. Download a registration form for the Peach Stroll.